Katharine Gun foiled that plan. 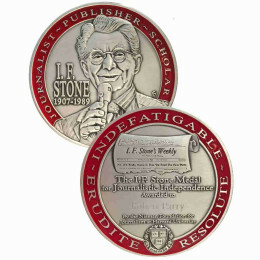 While scarcely reported in the U.S. media (despite cutting-edge news releases produced by my colleagues at the Institute for Public Accuracy beginning in early March of 2003), the revelations published by the Observer caused huge media coverage across much of the globe – and sparked outrage in several countries with seats on the Security Council. I happen to admrre this writer and Ellsberg, but outing the US hasn’t worked out so well for others. Risen. Solnit. Manning. Dozens of others since Bush 2. She was very lucky, and I greatly admire all who jumped into the fire, and all the others yet to come. What Katherine Dun did, I must assume, was noble. What Katherine Gun did and what happened was a devastating defeat for those like Gun who thought their protests would have an effect. When millions marched, we thought they had to listen. “They” didn’t. Contrast that to Ellsberg whose leaks occurred when there was a President important people didn’t like and a war against a state that had no interest in destroying. They made a movie about the guy starring Forest Gump and Meryl Streep. You might find a documentary about Katherine Gun that can be seen on U-tube. If a man murders his wife, he is charged with murder. If a man gets someone else to murder his wife, he is charged with murder. If the CIA or FBI or NSA wire-taps Merkel’s phone, that is fine, but they are forbidden by the 4th Amendment from wiretapping Americans without a warrant and presumably due cause. However, if they get British or Canadians or Ukrainians to wiretap Americans, they think that’s fine; and of course they surveil citizens in those countries and exchange information with ‘ally’ spies. Our spies, like most government officials, are above the Law. There is recent news of another “work-around” to bypass the Constitution. The FBI simply “outsources” the illegal work, and can claim clean hands. When I see an old computer at a junk store, if it is cheap enough I buy it for the parts. People forget how much of their lives are on those hard drives. Family pictures, job applications/resumes, and downloaded articles are among the “stuff” somebody else can now access. I’m only after the parts, and write “0” to every sector on the the hard drive before formatting it, but that’s not the case for everybody. For as long as humans believe in allowing ourselves to pursue and capture unlimited fortunes the least scrupulous amongst us will always be going hardest after that carrot. Now add another thing everybody knows: money is power. The way out of the nightmare suggest itself to anybody? A few years back I read a book on whistleblowers and the fact that about 95% of them have their lives destroyed because of certain coercive safeguards to keep them quiet. Regardless of “supposed” safety outlets, that rarely proves the case. This is why we don’t have more brave souls come forth and expose illegal actions of either business, and especially government activity, the damage can be severe. Ed Snowden is a political prisoner as is Assange, this is the price they pay. Accordingly, I can’t reference that book, sorry, it usually involves a person of sound morals and ethics that can’t live with the illegal activity and ends up being a battle within themselves that lets the whistle blow. They pay with usually, destroyed lives and/or long prison sentences. We quickly learn in elementary school no one likes a tattle tale, lessons that translate seamlessly into adult living. Besides Bobby Fischer all my American hero’s are whistleblowers, starting with Daniel Ellsberg, I celebrate them all. Thanx!! It would be interesting if some whistleblower revealed US efforts to undermine the EU and the euro. It’s a pretty open secret, but it would be quite embarrassing if it were said out loud that US government agencies were undermining what are supposedly major American allies. All the more so if, as I suspect, US intelligence services have allied with their Russian opposite numbers. Has a lot to say about how the United Nations has lost its intended impartial role to keep world peace and has become just a tool for the enforcement of American foreign policy. Just have your partners in collusion cheat and spy for you so you can lie with a straight face. The next obvious progression was the rhetoric of Samatha Power and Nikki Haley that turns reality totally on its head. What’s next, Israel and America are awarded a “peace” prize for effecting regime change in every country in the Middle East? There’s Katharine Gun and then there’s John Bolton, who was all for the bombing of Iraq. Tucker Carlson had him on as a guest a few days ago and it got a little heated at the end, I thought. Good for Tucker! John Bolton won’t be happy until the entire planet is a smoldering ash heap. Why would that make him happy? Killing 99% of the Earth’s population will ensure that he’s gotten most of his enemies… probably. I am not sure why Tucker Carlson, and Fox who gives him a platform, does not get more credit. Is there anyone else with real access to the Right who asks those types of questions? This is not a one-off interview, he does this consistently to many of our deranged political class. I hated Fox under Roger Ailes and Cheney/Bush, but Murdoch’s sons are not Ailes. Don’t join the military and do your best to keep your friends, family members & acquaintances from joining. Unfortunately the system is setup to destroy courageous individuals such as Katherine Gun;Julian Assange; Chelsea Manning & Edward Snowden who are hounded; charged with treason & pursued relentlessly by these corrupt Govts & Leaders and their “useful idiots” Mainstream Media lackeys who have killed journalism & who do not want sunlight shone on their dark, evil, dubious activities? Also if these whistleblowers had’ve been around in the sixties, the youth of that generation would have been marching in the streets; protesting on campus or rallying on Washington in support of these heroes but this snowflake generation is to distracted & brainwashed by propaganda & consumerism to even contemplate supporting the whistleblowers? You’re absolutely right here.When I was a teenager in the late sixties I remember well the anti war demonstrations and peace marches all over the world.Those demonstrators risked their life.I sometimes think the youth of today is in some kind of an agony. Think the final war is a myth that will never happen? Can you see the world as it really is, or do you only see what you want to see? oh give us a break! hawk must eat as an equivalency to and excuse for bankster-ushered massmurder of humans in pursuit of wealthpower?? Well, he might have copped that a net increase in entropy is the price paid to tap the free energy required to sustain life, but perhaps JHVH doesn’t know enough physical chemistry. To stop war, lay down your weapons. Turn your spears into pruning hooks. Can’t do that? Then welcome to the wars that lead up to the final war, the one that destroys humankind. I regard this as a key part of the essay. Control over perceptions – it really matters. Leakers cannot be automatically assigned roles of “heroes” or “criminals”. Circumstances vary, and one leaker may be a courageous champion while another deserves to be shot. An example of the complexity of this can be demonstrated by the big “leak” in 1941. Blazoned in huge black letters across page one of the December 4, 1941, issue of the Chicago Tribune was the headline: F.D.R.’S WAR PLANS! The Times Herald, the Tribune ’s Washington, D.C., ally, carried a similarly fevered banner. In both papers Chesly Manly, the Tribune’s Washington correspondent, revealed what President Franklin D. Roosevelt had repeatedly denied: that he was planning to lead the United States into war against Germany. The source of the reporter’s information was no less than a verbatim copy of Rainbow Five, the top-secret war plan drawn up at FDR’s order by the Joint Board of the Army and Navy. Manly’s story even contained a copy of the President’s letter ordering the preparation of the plan. The reporter informed the Tribune and Times Herald readers that Rainbow Five called for the creation of a ten-million-man army, including an expeditionary force of five million men that would invade Europe to defeat Hitler. To all appearances the story was an enormous embarrassment to a President who when he ran for a third term in 1940 had vowed that he would never send American boys to fight in a foreign war. Indeed, think of all the anonymous official government sources who leaked the ‘intelligence’ on non-existent Iraqi WMD programs to Judith Miller in 2002, or the subsequent leaker of Valerie Plame’s identity as retaliation for her husband’s exposure of the bogus nature of that ‘intelligence’ (Scooter Libby being the guilty party there). By a weird coincidence I’m currently reading “Double Cross” “The True Story Of The D-Day Spies” by Ben Macintyre. Popov was one of a stable of agents the Brits were using to misdirect the Germans. The author nearly has a fit when he describes the rigidity and general stupidity of J. Edgar Hoover. PS for readers: There’s a freebie dissertation pdf on committee 20, “A Game of Human Chess”: The Double Cross System and MI-5’s Supremacy in World War II. This one of many reaons why the Schumer-Clinton gang in the Democratic Party have to go; they’re basically just neocons. Notably, it was the British political refusal to go along with Obama’s push for NATO bombing of Syria that shut down that effort in 2013; otherwise ISIS would probably be ruling Syria by now (and Russia didn’t intervene until 2015). Point being, if the whistleblowers don’t get political support, then their efforts do nothing to change the status quo; for example, even though Edward Snowden revealed the illegal mass surveillance of the NSA to the American public, the politicians in this country rallied around the NSA, not the public interest, so the same domestic mass surveillance programs (and bloated NSA private contractor deals) continue to this day. I totally agree with you about the bombing-that-wasn’t in 2013. 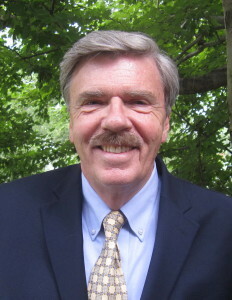 One beef I had with Robert Parry’s writing was that he always credited Obama with the good judgment to not ultimately launch an air war, and would never acknowledge, or even mention, the pressure resulting from the U.K. parliament for once refusing to go along with their own U.S.-lapdog government. And your final paragraph gets at what I was trying to say in my long comment above: the most important thing is ongoing political opposition to war and empire; no leak – no matter how factually damning – will amount to much absent that context. I believe also in 2013, in response to Obama’s floater on bombing Syria, there had been a lot of phone calls / emails / etc directed at Congress opposing this step, and in response Congress refused to rubber-stamp such a move and there was even pressure to debate the proposal in context of the existing authority (the 2002 AUMF). The common talking-point that Obama simply didn’t uphold his “red-line” has served as an instance of historical revisionism on this point. Sergei Lavrov warned the world that this would happen sooner rather than later and, right on cue, USA’s French poodle willing obliges. Another factor was a stern warning by Putin to Obama that an attack on Syria would be considered an act of aggression. He also dispatched a missile cruiser to the Mediterranean and called out the veracity of the chemical attack. Whistleblowers won’t get political support until the Deep State is brought to heel. It’s Schumer’s “six ways from Sunday”. Our so-called intelligence agencies are wielding all the real power, and have been since Nov. 22, 1963. That is root of the evil, and the only way that will ever be undone is for the people to go into the streets and demand justice. People like John Brennan, James Clapper, and the rest of their ilk need to be put in jail. Check out the bios of the Democrats who are running in the midterms. Thanks for the link. I think it proves that now more than ever, we desperately need a third party. The infiltration of our so-called intelligence agencies into both major parties is probably worse than ever, and their are no alternatives. The forty percent who didn’t vote in the last election added to the “lesser of two evils” voters, means the time is ripe for real change, but it will have to be a real grass roots effort from outside the two party system. The co-opting of Bernie to the Clinton machine in 2016 proves to me that any hope for change from within the corrupted republicrats is impossible. Totally agree. I voted for Jill Stein in 2012 and 2016 with no regrets. A friend of mine is contemplating running for state treasurer as a Green. We’ll have to work our butts off for her should she decide to go for it, but that’s what struggle is all about. And jfk wasn’t in thrall to Allen dulles? Missing from my above post: https://youtu.be/7f_Id6gtxz8. ‘Awaiting moderation’ prevented me from adding it in. I don’t know how that works. I waited, and waited, for my msg to be accepted so I could include this. Talk about a conversation killer. Does everyone get this treatment? I never curse. I don’t cause trouble. There are many honorable individuals who have resisted America’s Warring ways. I’m reading for the first time right now the very wonderful story of John Paul Vann who went early to Vietnam, tried desperately to change his superiors minds, reported what he saw and thought, then returned again to do what he could for both his country and the Vietnamese People. I mention him here because he deserves more recognition and very few people know of his service. I’ll link a Wikki article then a book review. Please read and understand his commitment. “Anyone who hangs out in American activist, particularly antiwar, circles soon comes to appreciate how multifarious is the task in a thoroughly militarized society. No sooner has one worn oneself out resisting one well-publicized U.S. war of choice than one discovers that another one has been going on far from the public eye. Most of us are conscious of the disastrously arrogant attempts to bring “American values” to Iraq; but how many know of our government’s parallel and largely quiet project of selling inhumane weapons to Saudi Arabia so that the Saudi princes can have their way in Yemen? How many activists have the time and resources to resist U.S. militarism on multiple fronts? Given that an antiwar movement in an imperium must cast its nets impossibly wide, it’s no wonder that the nonviolent struggle to build a world without war draws proponents from every class and predisposition of American Life. This brings yet another strain on the reflective citizen. While nearly everyone, on the left at least, can agree that endemic militarism is the problem, while great numbers can still be drawn to rallies, marches, and demonstrations of heartfelt concern, getting down to actually rendering militarism obsolete more often than not ends up fracturing us: Jane campaigns against drone wars, Joe rails against a particular president, Jerry becomes a vegetarian. Probably all of this helps the cause in the long run, but meantimes the individual activist can feel isolated and unsupported by erstwhile compatriots. This is where Professor Rosenwald’s ambitious ”War No More” comes in. It’s not your standard history, focused on well-recognized heroes – usually military – who purportedly single-handedly “make peace” – usually by military means. Instead it’s a picaresque ramble through three centuries of efforts by individuals, in many cases unknown to history, to celebrate in writing, song, and graphics and often putting their peace and quiet, if not more, on the line to defeat The Juggernaut of militarism that affects and stains all that is good in the American experiment. Reading these stories will be a great encouragement to modern day activists in the antiwar cause. And, somewhat like Howard Zinn’s “People’s History of the United States,” it will encourage citizens just awakening to their need to resist. Seldes “Witness To A Century” is a fascinating set of encounters with 20th century leaders, and very readable. His book “Quotations” is the best for political quotations. But be sure Not to recommend De Rerum Natura based on his quotations of its ancient scientific insights, as it becomes quite perverse in places. A new form of perpetual martyrdom may not be necessary or practical to curb the current excesses of the State, rather cut the malignant war growth out at the source, i.e. funding. The curious case of Britain’s income tax (1798, 1842) to first support war and then reduce tariffs for free trade financed on the backs of taxpayers, and likewise in the US (1863, 1913), is evident. Consider rather a decentralized form of Edgar Feige’s Automated Payments Transaction (APT) , i.e. a tiny, uniform flat tax with no deductions or exemptions(no special favors for markets) in lieu of the income tax(war tax), sales tax, excise tax, tariff and capital gains tax schemes. Due to technology advances in computing, this form of taxation may now be realized. I’d still leave some regulation around for extreme inheritance and extreme monopoly, as well as crack down on taxpayer subsidy and guarantee programs(housing, foreign aid, bank insurance) and rather reduce property taxes and rely more on local economic initatives where greater knowledge of community needs exist and may be mooted at the town hall. Distribute tax revenues to grassroots municipalities and allow for tax appropriations to bubble up through legislative levels to the Federal Government. That may provide greater political accountability and an incentive for community economic development incentives, as well as encourage civic participation. Broadening tax distributions (currency flow) to the wider productive sector and decreasing it to an increasingly tyrannical Washington and indirectly to unproductive speculation/manipulation in centralized metropolitan banking/financial centers may allow for lower-priced exports of goods and services , i.e. generate greater real production, more better-paying jobs and less trade deficits. Our monetary system may then be slowly tied back to a more stable budget and currency-rate standard for the nation. Reforming the welfare-warfare state may be attempted by phasing in payroll deductions and government subsidies for only actuarial ‘butter’ items, like COLA-adjusted long-term medical, unemployment insurance and old age insurance(unfortunately, these highly desirable public goods require stricter regulation of citizenship and immigration). The publicly funded military, intelligence and public relations apparatus appears to have become an unaccountable money pit that is less about national defense and more about delusions of hegemonic empire and corporate/banking profits. Returning to a higher standard of liberal arts education(adding ethics, logic and rhetoric) for our grammar schools and STEAM, economics, finance for High School, as well as school choice and merit-based pedagogue performance (rather than seniority and tenure) may yield a better educated, productive and more prosperous society. While this is great and the speakers in the video are also excellent, nobody is answering why. 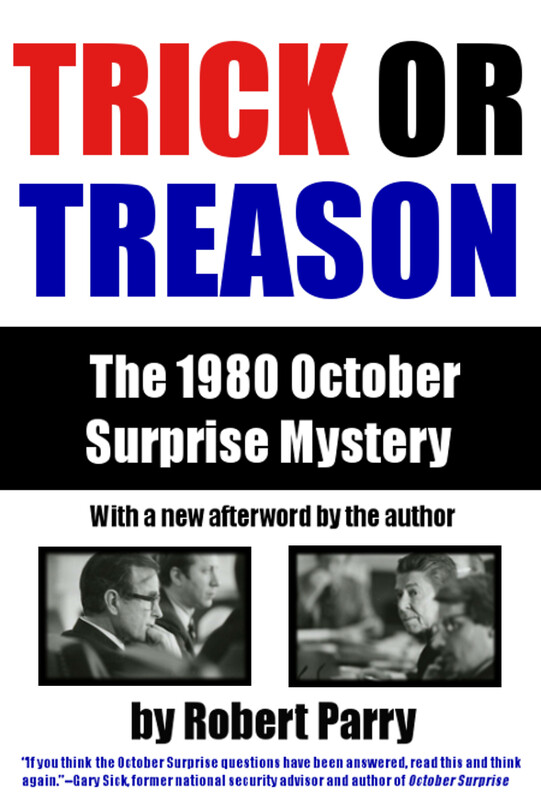 Why all the subterfuge and manipulation at the highest levels of government and the UN, what was the overarching plan and why? Neither the author nor the whistle blowers state the cause, only the effect. 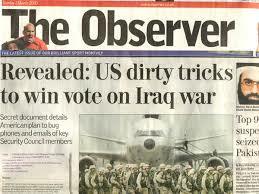 Why war with Iraq, who benefited? Why regime change to remove Sadaam, who benefited and had it planned for decades? Why the transparently fallacious neocon tale of WMD to manipulate public opinion? Why attempt to justify the illegal war crimes? Let’s start with Oded Yinon, then the Clean Break Strategy for Securing the Realm (whose realm? ), then PNAC. There is the cause. Gen. Wesley Clark – 5 countries in 7 years. How does the US benefit or is it and the taxpayer simply used as the attack dog with the requisite blood and treasure? Then Libya, Syria, Sudan, Somalia. Next up Lebanon then Iran. Who designed this and who benefits? Not the US citizenry. Why cloak and dagger deceit to mask the intentions? By way of deception thou shalt do war. why why why? Because the international banksters steadily increase their wealthpower by indebting both sides in every war – that’s why. Exactly, these scams are due to zionist traitors in Congress, secret agencies, and judiciary. The MIC just wants the money, any victim will do. The zionists are the traitors to be prosecuted. It is exposition of extensive zionist subversion and control of mass media that we need now. Of course Katharine Gun did the right thing, but let’s be clear: the NSA memo *did* get published before the war began, and the U.S. *did not* get the second UN resolution it sought, and as a result … the war was impeded not a bit. Gun faced two years in prison, presumably for violating the Official Secrets Act, but wasn’t prosecuted because “the government was not willing to have the legality of that war discussed in a courtroom”. In the U.S., with no Official Secrets Act on the books, a comparable leaker might still be in a Federal dungeon – I mean, prison – fifteen years later (Manning was sentenced to 35), and the judge at her trial would have made sure the illegality of the war was never permitted to be raised in her defense. Let’s be clear that the lies, corruption, and inhumanity undergirding the U.S. & friends’ perpetual war-making are obvious to anyone who cares to take an honest look. Certainly the perpetrators don’t want documents coming out showing the deceptions actually being engineered. But the main proof that they know they are lying is the fact that they are lying! And, as in 2003, the system is well able to absorb the shock of a few leaks, no matter how devastating substantively. Go read Jonathan Schell’s books “The Village of Ben Suc” and “The Military Half” – his reportage from Vietnam that appeared first as articles in The New Yorker, and then very soon after as books, in 1967-68. Anyone who read them at the time could see that the war was being conducted against the people of Vietnam, not for them. Nobody needed leaks to know that the military knew it too, and that any civilian leaders saying otherwise were also lying, or were either willfully or fatuously ignorant. So Daniel Ellsberg should take comfort. If he had gotten the Pentagon Papers out earlier, I’m dubious it would have halted one bullet or bomb. I don’t even know what I’m trying to say here. We have few enough brave, principled people that kibitzers like me shouldn’t be trying to discourage them. But I hope Ellsberg understands his responsibility if some insider heeds his call and pays the price, in an era moreover when a further half century of political/media decadence means the leaks won’t even be given the public attention the Pentagon Papers received. blowing whistles, getting out in the streets, ALL of that was done, pre-war, MILLIONS protested…ALL to no avail. What you are trying to say is that NONE of this works. Not even refusal to pay your taxes and going to prison impedes these nefarious plans one whit, which only serves to assuage a personal conscience (BFD…want a medal or something?). A Higher Power must be appealed to (only by those who believe in such things…and THAT is being done, with results…and THAT will never be told to you by MSM, so don’t look for confirmation there, nore here neither, as this comment will probably be taken down by the Moderator). While the British legal system still has shreds of decency unlike the utterly corrupt US judiciary, it is still possible for leakers to remain hidden or to flee to a competing superpower like Russia as did Snowden. British leakers may still be better treated. There may be sanctuaries like Ecuador (Assange) if one plans ahead. But apparently there is also a new culture of reporting sentiments of coworkers in US secret agencies, that must be avoided. I would not blame the successful leakers for the results of suggesting further leaks of major improprieties within secret agencies. That would be blaming casualties of defense upon the patriotic. Suggestions to protect leakers would be sensible. David G – thank you – I DO know, (I think) what you’re “trying to say here”! First thanks to Norman Solomon’s steadfast work to introduce reason and sanity into the madness. It’s no easy task. The reason I feel I understand just what you are saying is because I’ve viscerally experienced it too when I see the hysteria mounting to drive an agenda that is carried along on fear and ignorance. And then, at the end, financially benefits a very few while costing the many in blood and treasure. I, too, along with many others, watched in horror in late 2002, early 2003, the slow, transparent, clumsily orchestrated, relentless march towards the Iraq War. The transparent use of the trick resolution to draw in people who should have known better – the ambitious Hillary Clinton, John Kerry and John Edwards who voted “yes” on the AUMF which was designed to give Bush cover and they should have been smart enough to know that and maybe were. They also should have had the character to stand up to it if they believed that they had the stuff to serve as president. It was as clear to me as the nose on my face especially after George Tenet confirmed it during Congressional testimony when asked if Iraq had WMD in late 2002 or early 2003 before Rumsfeld’s deadly “Shock and Awe” decimated Iraq and Cheney paved the way for Hallurton to clean up on the backs of our soldiers (their rotted meat food lockers; their electrocuting showers and the rest)…..
And in my own little way I tried to publicly discredit the lies of my Congressman who had come home (as I expected) to sell the war to his constituents. In anticipation of trying to do that I attended his shamTown Hall where he told us that the president knows things he can’t share for national security reasons, blah blah blah….Iraq is a threat….blah blah blah…. and on and on…. That dumb Culberson fell into my trap, but it didn’t matter – first he called on me during the Q&A. I took the opportunity to ask publicly if the CIA Director knows the same national security secrets that the president knows. Culbertson answered “yes, of course”. And so I let him have it with – “well I saw George Tenet say during Congressional testimony when asked about Iraq’s WMD something like – we don’t know whether or not Saddam Hussein has WMD but we believe he is well contained and he will not use any weapons he may have unless we invade and then we think he’d use what he has against our soldiers. BAM!!!! By this time, one of Culbertson’s goons was standing almost over me and counting the seconds down to where my time was up. And Culbertson started screaming at me to never make a statement in his town hall again – “you can only ask a question not make a statement” he yelled. Later, I got on Sam Donaldson’s radio show and told the same story about Tenet ( I think that may have happened after the war had started.) Surprisingly, Sam Donaldson didn’t cut me off but quietly said that he too had heard that testimony from Tenet. So it didn’t matter. Donaldson could have spoken up but didn’t. The dynamic was in place that to criticize the president during war time was just short of treasonous and harmful to the troops. No one ever speaks up and says – the troops deserve better – they deserve to be protected from fighting and dying in a preventive war driven by lies that makes this country less safe. The Judith Miller front page NYT lies sounded like propaganda, not journalism. The Colin Powell United Nations aluminum tubes talk sounded ludicrous and there was Tenet sitting behind him rolling his eyes beside the cynical darkened hooded eyes of John Negroponte. Tenet never said anything. There’s a pattern to this that’s repeated again and again through history. People get whipped up into a frenzy of acquiescence using lies and illusions and fear. The Cold War ideology – which is still with us – contains some code words that allow acts large and small of injustice that ultimately wind up padding the pockets of a very few while stealing lives and treasure from the rest of us. Cheney let slip before the 2000 inauguration, pushing for a big price tag gala event, something to the effect – “now it’s time for us to get ours”. Wow he got his alright. The only historian that I’ve come across who has tried to examine the MACRO timeline of historical events with the MICRO psychological underpinnings of these events is Hajimu Masuda. Professor Masuda was studying at Cornell when the mass illusions of Bush/Cheney/Rumsefeld were used to drive the country to war. Masuda saw the parallels with the Cold War illusions and lies and hysteria in Asia that helped drive the Korean War. His fascinating book “Cold War Crucible” is chock full of the quotes and events happening in average people’ lives in Asian countries that paralleled the McCarthy era here in the U.S. Thank you, Ms Gun. Thank you, Mr Ellsberg and all the other many conscientous objectors to the web of lies and manipulation pushed onto us by liars and oppotunists in the mainstream media. The saddest loss of all (aside from millions of deaths) is our loss of trust in the mainstream media. Fully agree: msm will have a very tough time would they want to regain the lost confidence. The same is true of most of our politicians as well. In this new world, how much moral advantage does the “free world” retain? And that is why people share on Consortium News. Thanks for giving us a place to speak out, Robert and friends. We need more people like Katherine Gun. We people also need to get out in the streets. Yes. I also think that we need to support those who are being censored by urging them to sue. See Richie from Boston who sued to get his Youtube channel back up (the charge was bullying). Youtube backed down. Monetary damages should be considered based on First Amendment rights. If a bakery must bake a cake for a gay couple, I do not see how Youtube can block free speech, so the “private corporation” argument does not fly. #womenmarch4peace Not affiliated with the pink hats marches. JOIN US!